The best protein supplement is also one that is consumed at the right time. For instance, you would not want to use a fast digesting whey concentrate before bed, as you do not want your blood sugar, and subsequently insulin elevated at night. This would interfere with the growth hormone output that happens during your sleep cycle. Unless you require a casein free diet, caseins would be the best choice at this time because of their very slow digestion. Now if you have just worked out hard, then a fast digesting whey like concentrate would be perfect, because elevated insulin is beneficial right after a workout to help get proteins into muscle tissue! A meal replacement supplement is generally ok to be consumed at various times during the day, but are best avoided close to bedtime. 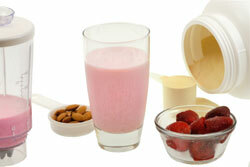 Some of them contain mixtures of whey and caseins that strike a balance between rates of digestion. This makes them good all-purpose supplemental proteins. I have focused on the best supplement sources in this guide, however food sources of proteins such as meat, fish, chicken, eggs, cheese, and milk should be your main sources. A meal replacement supplement is great when you are on the go and cannot prepare a meal, or after a workout to quickly get proteins into your body for muscle growth and repair. However high protein foods should be foundation of your diet. There is one source that stands out as the most complete in my mind. They have a wide selection of the best protein supplement products, as well as the ability to customize proteins per your individual tastes. If you have restrictions such as a casein free diet, then you will find plenty of alternatives available there! There are also a number of meal replacement supplement products to choose from to suit your individual requirements. They have an active online forum where you can get answers to your questions about proteins and supplementation from their helpful and knowledgeable staff and members. If you like what you see and decide to order from them, be sure to use this special code which will get you a 5% discount on all products. In addition, an order of bulk protein powder of 16 pounds or more will get you an additional 5% discount, for a full 10% off the regular price. Going forward, I will be posting links to articles on proteins and supplementation. This is one of the most important nutritional areas for antiaging, because sufficient intake of quality proteins is vital to health and wellness. Using the best supplements in addition to a good diet will help you ensure that you are getting the high quality proteins your body needs to build and maintain the lean body mass vital for health and longevity.